In light of another disastrous game in Tampa for our Bucs, let’s talk about one bright spot of the day. The defensive line was as stout as we had seen this year. Before the injury to Gerald McCoy, he was a force to be reckoned with, consistently getting penetration at the line of scrimmage. 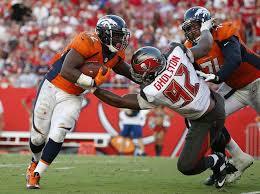 Gholston even managed to produce a half sack and a couple of tackles for loss. And then the man that really showed me something yesterday, Clinton McDonald, when GMAC went down he stepped up and went into beast mode causing trouble for the Broncos all over the field. McDonald ended up being the leading tackler in the game with 8 total tackles and also had 1.5 sacks. The defense as a whole was terrible again yesterday (and when your DT is your leading tackler something’s not right), but when you see certain parts come together and cause damage like the D-Line did, it gives you hope that something great is on the horizon, it just takes some time for Greatness to be achieved. Clinton McDonald returns to practice. Roberto Aguayo comes up big in Prime Time win! Previous articleMike Evans could very well dominate the Denver secondary, today.